Space Exploration Technologies Corp. launched an Indonesian satellite into orbit early Tuesday, notching another milestone in its bid to quickly reuse rockets in its 15th mission of the year. The Elon Musk-led company re-flew a booster for a second mission in less than three months, this time to carry a commercial satellite for PT Telkom Indonesia aloft from Florida. This marks SpaceX’s first reuse of a Falcon 9 Block 5, a version of its workhorse rocket that was built to be launched as many as 10 times, with limited refurbishment between missions. 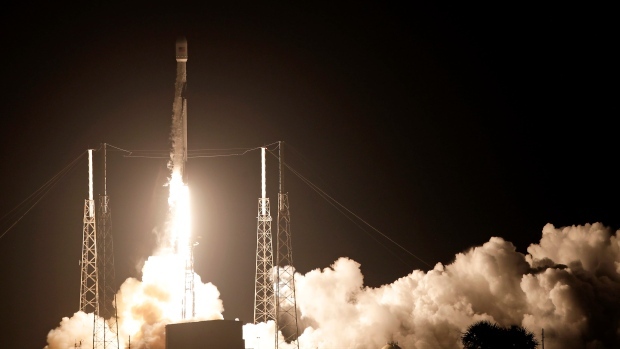 The Falcon 9 lifted off from Space Launch Complex 40 at Cape Canaveral Air Force Station at about 1:18 a.m. local time. The rocket is slated to deploy Merah Putih, a geostationary communications satellite that will provide service to Indonesia and other parts of South and Southeast Asia, roughly 32 minutes after the launch. About 8 minutes after launch, SpaceX will attempt to land the Falcon 9’s first stage on one of its droneships, named “Of Course I Still Love You,” which is stationed in the Atlantic Ocean. SpaceX is targeting roughly 30 total missions this year, up from a record 18 in 2017. Musk said in May ahead of the debut launch of the Falcon 9 Block 5 that, within the next year, he wanted to fly the same vehicle twice in a 24-hour period. Tuesday’s launch is the 15th time that one of the company’s “flight-proven,” or previously flown, rockets has returned to space. Reusing boosters instead of scrapping them after each use -- and limiting the amount of upkeep in between -- has the potential to significantly reduce the cost of space flight. SpaceX’s progress in this pursuit has contributed to the company becoming one of the most valuable venture-backed startups in the U.S.